Boy Scout Troop 50 | Chattahoochee Council | Auburn, Ala. | #troop50: Lions and tigers and bears...oh my! Troop 50's February campout the weekend of Feb. 17-19 centered around a trip up I-85 to tour the Montgomery Zoo and to camp at Fort Toulouse in Wetumpka. Mr. Darby compares the size of the barn owl's skull to the overall size of the bird's head. The troop woke to a damp morning after an evening filled with intermittent rain showers. After a quick breakfast Saturday morning, the troop headed to the Montgomery Zoo, where it was treated to an owl presentation arranged by Troop 50 parent Randi Cottier. During this time, zoo docent Brooks Darby discussed the distinguishing features and lifestyle of the barn owl. Mr. Darby explained characteristics of the owl that make it a remarkable hunter, as well as how the zoo cares for these and other birds that comprise its collection of animals. Following the presentation, Scouts gathered in small groups on their own self-guided tour of the zoo until lunchtime. enclosure as part of the troop's behind-the-scenes zoo tour. you know you're in for a treat! Luke holds just one typical-sized elephant tooth. The troop returned to Fort Toulouse in time to witness a portion of the camp's monthly living history events. 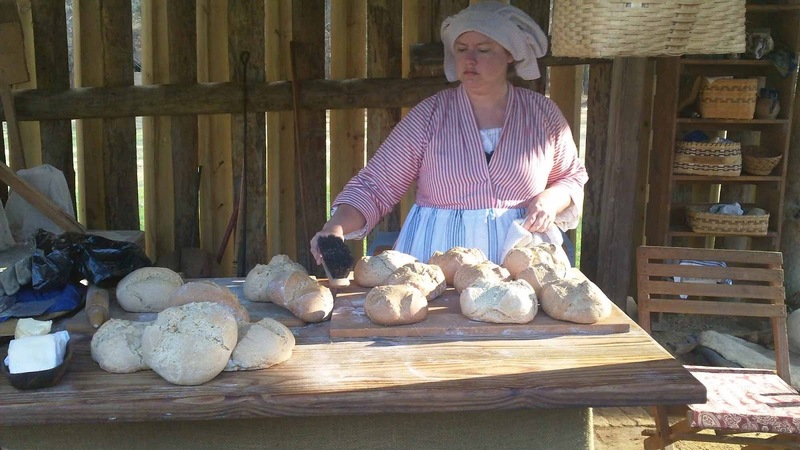 Scouts were able to experience elements of life in the earliest days of the United States, including attire, weaponry, and cooking. 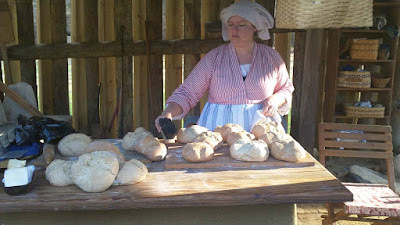 The troop even received several loaves of homemade, colonial-era bread to enjoy during dinner. The Armored Armadillos feast on their hamburgers with all the fixings! Scout and leaders pulled out all of their culinary stops in preparing Saturday evening's dinner. The Armored Armadillos prepared a dinner of hamburgers, with some Scouts opting to use their loaf of colonial bread as hamburger buns. The Patriots prepared hobo meals, a classic campout delicacy relying on foil pouches filled with meal and vegetables of one's choice and placed on a bed of coals to cook. The Leadership Corps enjoyed a camping version of chicken cordon bleu, which featured grilled chicken topped with ham and cheese. Joe (left) and Hunter (right) welcome everyone to Saturday evening's campfire program. his appreciation for the promotion. With full bellies, the troop gathered around the campfire, where Joe and Hunter offered a campfire program to complete a portion of the requirements to earn Communications Merit Badge. Scouts and leaders were regaled with a variety show of campout proportions that featured both tried-and-true and original skits, songs and stunts. At the conclusion of the campfire, Scoutmaster Andrew Baird prepared the troop's newest Eagle Scout, Creighton, who passed his Eagle Scout Board of Review in January, with a junior assistant scoutmaster patch denoting his new leadership position. After the fog cleared Sunday morning, the troop followed breakfast with efforts to pack up gear and ready the troop for the return trip home. Before departing, however, Scout and leaders gathered for the troop's traditional "duty to God" devotional. With a trip to the zoo following the rains of Friday evening and Saturday morning, a devotional centered on the story of Noah and the ark seemed only fitting. Scripture references and discussion centered on not being distracted by others and remaining focused on what God expects of us, trusting God to guide us and to be our strength during tough or challenging times, and that, God's forgiveness and grace and waiting for us during times when we are weak and sin. At Monday evening’s Patrol Leaders Council, the troop’s youth leaders were pleased with the troop’s ability to study owls and participate in the behind-the-scenes tour at the zoo. They also commended efficient set-up efforts on Friday and packing up on Sunday, overall meal-planning and cooking efforts, the creative and entertaining campfire, and the overall quality of the campsite. They also noted that the campout emphasized the need for selecting a troop quartermaster; addressing campsite noisiness and an occasional lack of cooperation with a each other and respect for youth leaders; reviewing campout dish-washing techniques; and avoiding damage to equipment after one tent was ripped during the campout. For more photos from the camping trip, visit the troop's online photo album.